Food, growing up, romance, drama, comedy, and danger all mixed together to make this book! There seems like there would be too much going on, but it all worked well and heck of a ride. The story follows Pen and Xander who seem to be so different, but they have so much in common in the end. Pen is the daughter of a restaurant owner. She has a hard exterior, but she is a sobbing mess like the rest of us when it comes down to it. Xander is an illegal immigrant who was abandoned by his parents and he fell into a dark place and joined the local gang. In order to make a new life for himself, he accepts a job at Pen’s Dad’s restaurant. He starts working the night that Pen is fired because she lied about going to school. Her parents kick her out and say she needs to go make on her own. 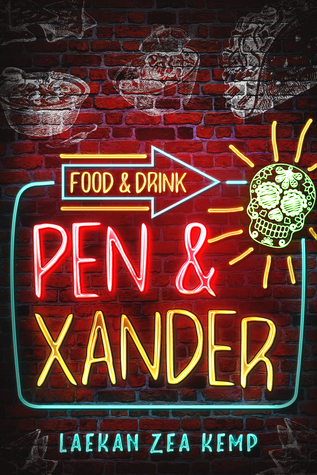 For some reason, Pen and Xander stay in touch and their friendship grows to love. Poor Pen. Yes, she lied about going to school, but she had a good reason. She was pretty much forced to go to become a nurse like her mom. However, that is not her dream. She wants to run a restaurant…either her Dad’s or her own. Firing her and kicking her out seemed to the extreme. Okay…kick her out, but at least let her keep her job!! That is just setting her up to fail. I get what they were proving…but still. Poor Xander. He is trying to escape his troubled past and find his father. Both of his parents abandoned him and his grandfather raised him. Yes, he loves his grandpa, but he needs answers. At least his mother had the respect to tell him, “Yeaaaa….I’m leaving…bye….don’t bother finding me.” The father simply just walked away. I don’t blame Xander for needing closure and answers. Luckily the local cop sees the good in him, so he helps him walk away from the gang and get a job at the town’s favorite restaurant. There was a little bit of an insta-love with the two. But it seemed to work and plus they didn’t know it was love-love. They went on some dates and things happen. They didn’t realize they loved each until near the end, so it worked well. They both had a lot of growing to do before they could have their HEA. I’m glad they were there for each other to help. The side characters were entertaining. I wouldn’t mind seeing more of Angel and Cloe. Ooo, I also want more of Claudia. I grew to love Claudia. She reminded me a lot of someone I used to work with when I worked at a crappy fast food joint. Luckily mine wasn’t racist like that one was though. Reading this made me hungry. Nothing is better than authentic Mexican food or chocolate. Yum! I really enjoyed this story. The characters were entertaining and the drama was enthralling. The parents annoyed me and I really questioned their parenting abilities. Yes, they made it up near the end…but still. Questionable decisions there for sure. Now, I honestly read this in a couple of sittings, because I had to know how everything was going to be fixed. The ending was sad but full of hope. I liked the ending a lot. It worked well. If you like food, romance, comedy, danger, and drama…I will point to this book. In the end, I shall stamp this with 5 stars. It sounded so good, right up until the sad ending. I want happy endings. Sad ones, even with hope, just don't make it. It was happy, but it was sad at the same time.